The nearly 900,000 minivans include models years 2005 through 2010. Here, the Odyssey is pictured at a dealership in 2010. 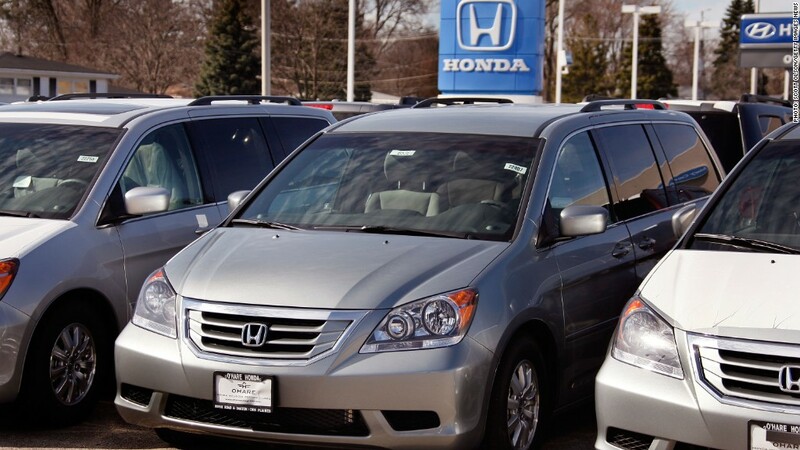 Honda is recalling nearly 900,000 minivans for a defect that could increase fire risk. The automaker said it expects replacement parts won't be available until the summer, but it can provide customers a temporary repair in the meantime. Honda said it would begin notifying customers in about five weeks. Honda said it knows of no fires or injuries as a result of the issue, which it described in a filing with the National Highway Traffic Safety Administration: "Prolonged exposure to acidic chemicals and a high temperature environment may cause the cover of the fuel pump strainer to deteriorate prematurely in a manner that can result in cracks in the material." Fuel can then leak out of the cracks, Honda told NHTSA, "increasing the risk of fire."